As we are now in the first few weeks of the New Year, I have been spending many hours spring cleaning, re-organizing and assimilating new toys. When I think about the overall design of my home, it's important to me that my home is as functional as it is beautiful. Now if a decision comes down purely to function or aesthetics, the scales do tip slightly in favor of aesthetics (you won't see a subwoofer sitting by my TV) but a room NEEDS to work for the people who use it on a daily basis. For those of us who have kids, it's often they who are using our spaces the most and considering them in your design is important. But at the same time, just because you DO have kids doesn't mean they need to monopolize every square inch of your home. It's important that grown-ups have a peaceful space to unwind-- and sometimes peace is visible, as in not having toys in every corner of common spaces! I'm thankful to have so much more kid space in our new home, but I am well aware that we are maxed out! In order for anything else to come in, something else will need to go. I regularly go through all of the toys and throw away or donate what doesn't fit my criteria for keeping. 1. When shopping for anything (not just toys) if you don't currently have room for it or if you can't envision exactly where it will go, don't buy it. There will always be something else you'll have to have, when you DO have room for it. Plus, once you actually have the space, you'll have a much clearer idea of what the space will be best suited for. 2. If your living room looks like Toys-R-Us, it's time to pare down. 3. If you're considering a toy that A-came free with a kid's meal or B- came in party favor goody bag-- pitch it. 4. If you're considering getting rid of a toy you already own or are thinking about buying, ask yourself if said toy will service more than a single purpose or type of play. There are endless toys out there with a million parts that really just do one thing. Focus on toys that will inspire creative and imaginative play and aren't limited in their function. I would never deny that my child has a lot of toys, but 95% of her toys will fall into the categories of: 1- play kitchen and accessories, 2- dolls and accessories, 3- musical instruments, 4-blocks, 5-books, 6- dress up, 7-toy train. 5. If the toy has not gotten regular play in the previous 4 weeks, it's a definite contender for donating or selling. Now once you have pared down to the toys that are truly worth keeping, you'll have a better idea of what type of storage makes the most sense for you. At our house, I try to make toys as visible as possible so they are easily found. Often times, toys aren't played with simply because they are lost in the rubble and forgotten about. Because the bulk of Holiday's toys fit into the categories of Kitchen Play and Dolls-- I set her toys up in a way that she (and every other child who visits our home) WANTS to jump right in and start playing. I'd love to share with you a few kids areas I've created for our home! It's hard to tell, but there are TEN dress up costumes (and accessories) on those two hooks! And even though these costumes, and this space, is very girly-- there's no reason why you couldn't use the same concept for a boy's room or even a gender neutral space. I love that this just takes up a few feet of wall space. At first, I had the costumes simply draped on the hooks, but after some rips from having a hard time getting the costumes off the hooks, I decided to hang them on hangers and it's worked SUPER well and made them more accessible to little hands. I bought these hangers on Amazon, they are felted which keeps the costumes (often with slippery material) from falling off. Also with using hangers, if there is a special necklace, mask or stethoscope that goes with the costume, I can put it around the hanger and keep it with the costume. Besides this space being super cute in my daughter's room and quite functional, I'm very proud of the creative process and originality behind the design! What I've learned with decorating and design is that MOST times, spaces don't end up looking exactly like my original vision and sometimes not at all like I planned! During the creative process I usually find an item I LOVE and want to incorporate into the space and the design takes a turn and starts to go into a new direction! Don't be afraid of moving out from your original concept! When you work your design around things you love that really resonate with you, you'll end up with a space you truly enjoy to be in and just love looking at! So this particular space started with the Princess picture I found at HomeGoods while we were building our home. When I purchased the picture, I had planned on using it in the Play Room-- this space is actually a bump out, bonus space in my little one's bedroom. The little shelf I picked up on clearance at Hobby Lobby thinking it would be really cute above her kitchen set to put some of her little play cupcakes and things on. On a whim, I decided to try the picture on this wall and seeing the crown on the picture made me think of how adorable it would be to display some of her little tiaras. I just happened to have these hooks that my mom had given me and realized how perfect her princess costumes would be hanging underneath! So that is a peek into my creative process and the progression of this idea! The vanity and stool as well as the mirror were all birthday gifts my little one received from family, really making the space complete! As we speak, I have a small cedar chest in my garage that I'm planning to paint and re-purpose for all of her dress up jewelry, shoes and accessories, but that's another blog post! There is a beautiful Pottery Barn Kids wardrobe that matches the vanity, but I just LOVE how this little area turned out and how custom it is. It's beautiful, functional, takes up very little space-- what more could you ask for?! One of the benefits of moving to a larger home is that we have an upstairs Play Room. I love that I don't have kid toys lining the wall of our main living areas where we spend a large majority of our time. Of course if I'm cooking or working downstairs, Holiday also likes to be downstairs with me and will bring toys down with her. I keep a basket at the foot of the stairs and at the end of the day, everything that belongs to her goes back upstairs and as part of our night time routine, we put it all away. Earlier this fall, Holiday's train set kept making it's way downstairs. She would set it up on the floor and play with it for long periods of time pretty much every single day. I realized she liked playing with it on the wood floor because it never worked well upstairs on the carpeting. The wooden tracks wouldn't lay flat and as she would try and push the train all the way around, she would inevitably step over the train set and knock half of it over. To top it all off, the train set was just wide enough that it didn't fit on any of her little tables or play spaces we already had. During this same period of time, I had been actively looking for a coffee table for this space. I had contemplated buying a train table a year ago, but at the time, I really didn't see a good place to put one. Then one day it hit me. I had seen the white Activity Table from Pottery Barn Kids many, many time in the catalog, but it never crossed my mind to use it as a coffee table, but why not? Granted, I would LOVE it more if it had turned legs-- that would just totally make it for me. But, I have other white wood furniture in this open space and the chalkboard signs are kind of repeating theme in my living room already (various baskets underneath the TV console). Plus, between some discounts and coupons I had along with the table being on sale, I was able to purchase it (after taxes, shipping and handling) for $300 which is less than half the price of several of the coffee tables I had on my list. There are two large rolling bins underneath for toy storage and if they're tucked under the table, you cannot see the contents of the bins unless you purposely get down to look in them! The Activity Table also has a lip on it (a bit hard to see in pictures) that keeps the contents from falling off the table. Now that we've had the Activity Table/Coffee Table in the space for a few months, I couldn't be happier with how it has functioned. Holiday has really loved having a space to play on in this main area. The bins underneath are really very large. Currently we have her train set in one and the other is full of Tegu blocks. When we're having company or just putting things away at the end of the day, I can put my lantern back on and it reverts back to a grown up space. And best of all, I have not spilled a drink on my beautiful rug since putting the table in the space (which unfortunately happened more times than I'd like to admit while sitting drinks on the floor by the couch). The more I think about it, the coffee table is the one piece of furniture in a living room that will get wear and tear no matter what! You can buy a really high end, high quality couch, having it professionally Scotch Guarded so it can well withstand the kid years and still look great, but it doesn't matter how much you spend on a wooden coffee table it will inevitably get nicks and scratches. Being in a phase where we have a small child and will likely have more-- this totally makes sense for us! I think it's pretty enough for the space and if at any time I decide otherwise, I have a great piece to move to the upstairs family room. For the price, you can't beat the storage this Ikea shelf offers. The Expedit shelving from Ikea comes in a variety of colors, sizes and configurations. The polka dot fabric bins are from Badger Basket (Amazon or BabiesRUs) and are the perfect size for these cubbies! The chalkboard labels are by Martha Stewart from Office Depot. They have been on these bins for a year and are still sticking well! I wasn't sure if labeling the bins with chalk was very practical for a kid space where they could easily get wiped off, but that hasn't been an issue at all. Every few months I might have to fix one or two, but they've actually functioned really well. I especially want to draw attention to the few cute buckets I have in some of the cubbies. Easter time is a GREAT time to find fabulous buckets very inexpensively-- Target always has a good selection. Adding the chalkboard labels makes them ultra cute AND practical! I've even used them instead of gift bags with the child's name on the label-- such a practical gift that doesn't cost much more than the gift bag you would have bought otherwise. While we're on the topic of Ikea-- these picture ledges make perfect front-facing book storage! Not an original idea, I'm sure you've seen it elsewhere. My twist on it is that I regularly alternate the books by season and holiday. So right now I'm featuring Valentine's Day themed books. This little area also happens to be right beside our Valentine Arts and Crafts Station that you'll see further down in this post! One more ode to Ikea, these curtain hanging wires turned art gallery! While I was blogging about Project Advent in December a friend asked me what I did with all of Holiday's projects aftewards and this is the answer! Still displaying our many Christmasy projects! I alternate the gallery every few months-- I store away the things that are super special and throw away the rest when Holiday isn't paying attention! She loves her Gallery and will often race upstairs to hang a picture up after she finishes it. Her KidKraft easel also has a white board on the back and is a GREAT toy to have around! This little nook is at the top of our stairs-- right outside of Holiday's Play Room and Bedroom. It was originally designed for a built-in desk which we opted not to include when we built our home. If you wanted to re-create a gallery like this against a flat wall, you would need the L-brackets also sold at Ikea. This type of space doesn't need to be in an exclusive area-- it would work equally well above a desk or even on the wall beside the bed-- there are endless possibilities! This is another little area in Holiday's Play Room that we refer to as her desk. She normally will spend quite a bit of time here throughout the week creating projects and pictures for her gallery. When I was cleaning up Christmas decor, I wanted to do a few special things for Valentines Day so she had another holiday to look forward to! Granted, there are a lot of really fun craft supplies that you COULD add here like glue, glitter glue, glitter, etc! I decided to stick to things that are fun and mess free that she could easily play with on her own. Some of the items I had, the rest I purchased in the $1 aisle at Target. Holiday has spent hours upon hours making Valentines at this table over the past few weeks. She keeps adding to her collection that she keeps in a little pink polka dot suitcase by her desk. I have to say, with the supplies I included, her valentines have actually all ended up being very cute! Some of the items (like the glittery pom pom balls, straw and pipe cleaners really haven't made it onto the valentines, but she has so much fun playing with them. The other jar has loads of all different kinds of heart stickers that I keep refilling. The area has been such a hit, I definitely plan to update it seasonally along with her book ledges! I pulled out all of her pink, red and purple crayons to put in this little bucket. 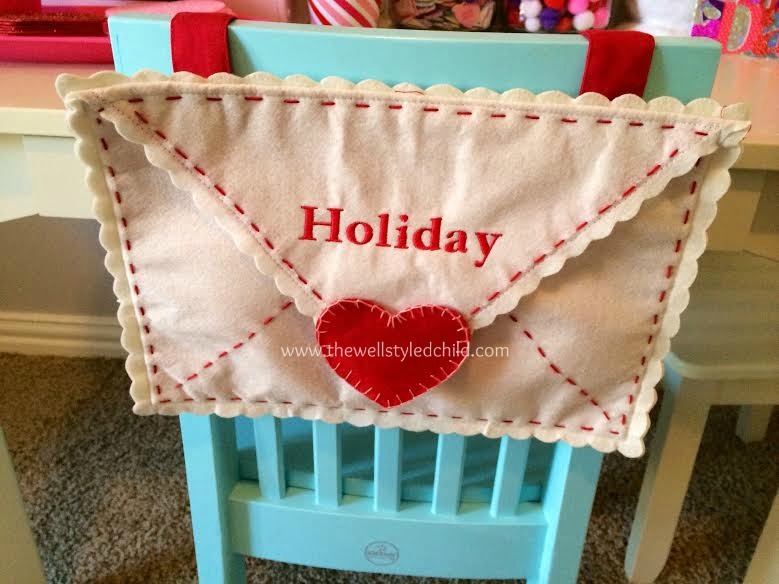 Pottery Barn Kids Envelope Chair Backer-- great little place to store Valentines! I hope these spaces have given you a little inspiration for creating some great imaginative play spaces in your own home!